For a lot of people, a parking spot with your name on it is a measure of success. If that’s the case, strike up the band, pop open a bottle of champagne and let’s celebrate. Because I have officially arrived! Amy Glass has recently been stirring up a firestorm with her comments that women shouldn’t aim to get married and have children (I won’t repost her blog here, because I don’t want to send anymore traffic her direction.) Her theory is that anyone can do that, so it’s not an accomplishment. “You will never have the time, energy, freedom or mobility to be exceptional if you have a husband and kids.” Ouch! Six years ago, I chose to become a stay-at-home mom. That decision was partially because of the ridiculous cost of daycare for an infant, but it was also largely because I wanted to raise my own kid. I didn’t want to pay someone to spend time with my child that I could have been spending. I made the choice to put a possible career on hold so that I could concentrate on raising my kids the way I wanted them to be raised. It was a tough decision to make, and sometimes I still wonder if it was the right one. But when my daughter sits down with her pretend laptop and works on writing an article, or my son reads his own fortune cookie, I know it was the right one for us. My mom raised three kids. She is an exceptional midwife, as well as an exceptional mother. I know moms who are teachers, counselors, nurses, doctors and lawyers. I also know moms who, like me, devote their time to taking care of their kids. Whether they work or stay at home, the world NEEDS exceptional mothers. If every halfway intelligent woman decided not to have children because she wanted to concentrate on her career, where would society end up? Mothers are not just brainless incubators that are responsible just for making sure that the human race continues to exist. They are responsible for raising the next generation to be exceptional. What it really comes down to is the fact that everyone should be allowed to make their own choices in life without being criticized. There is nothing wrong with a person who chooses not to get married or have kids so they can concentrate on their career. But there is also nothing wrong with a woman who chooses to spend her hours cleaning up toys, washing laundry and wiping snotty noses. 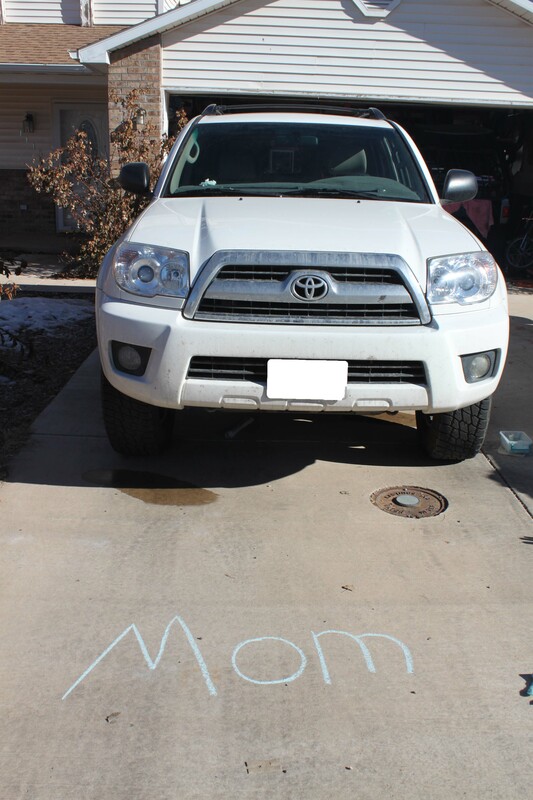 So for me, I’ll take my name on my parking spot, which has now been decorated by my children, and I’ll keep doing what I do. Because these are the choices I make, and that’s all that matters. The other day while we were driving my six-year-old announced that he’d decided what he wanted to be when he grew up. My heart swelled in anticipation. What would it be? An soldier? A firefighter? A doctor? No. None of those. He wanted to be a . . . (pause for dramatic effect) dishwasher at a hotel. Now, no disrespect towards dishwashers everywhere. It’s certainly a necessary job, and it’s one of the many duties listed on my resume as a stay-at-home mom. But it wasn’t exactly the type of shoot-for-the-stars goal I’d anticipated. Especially since I can’t even get him to help wash the dishes at home. So we talked for a while about some of the other career options that are available, and he finally changed his mind. Now he wants to be a scientist. Pretty broad, and I’m not sure the pay is much better, but at least it’s something to shoot for. Afterwards I realized that, at almost thirty-years-old, I still don’t know what I want to be when I grow up. The uncertainty is a little disconcerting, especially because I always had a plan when I was younger. For most of my childhood, I wanted to be a veterinarian. When I was in middle school I set my sights on Colorado State University because they had a good veterinary school. I did an independent study with a local vet, and I joined 4-H where I raised sheep and goats in addition to my family’s menagerie of dogs, cats and the occasional llama and horse. Then, sometime in middle school, like most childhood dreams do, things changed. After a particularly unsettling injury to one of the goats in our flock, I decided I didn’t have what it took. For a while, I was set on being a country music singer. (Good thing none of you have heard me sing. The shame would be unbearable.) Then it was a teacher. Then a musician. Or a Marine. I started college as a music major, but changed quickly thereafter to English. I wanted to be a writer. In all reality, making it in this world as a writer probably isn’t a whole lot easier than making it as a singer (short of the fact that I have at least a smidgeon of talent when it comes to writing. The same can’t be said for singing.) But I was passionate, and I started writing my second novel. Six and a half years ago, my son was born. When my husband was offered a job in Moab, we decided we’d move, and I would stay at home with my son. So now, here I am. I am a wife and mother. And even though it’s hard for me to admit, I’m a writer dammit! This definitely isn’t where I thought I’d be when I was a kid, but I’m happy to be here. At least I’m not washing dishes in a hotel. And who knows. Maybe some day, I’ll find a real job. Or maybe I’ll find a way to make writing a real job. Only time will tell. So what about you? What did you want to be when you grew up? Did you make it?